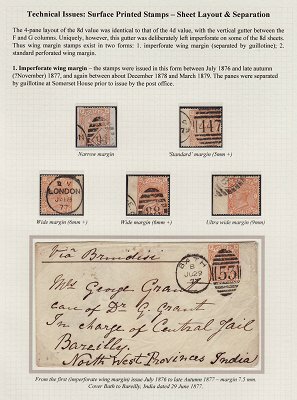 The pages in this section link to scans of displays on various subjects of Great Britain philately, which have been submitted as a resource for members of the GBPS. The introduction page for each display may be read by anyone, but to view the displays themselves you must be logged in. The page images themselves are resized to fit roughly into the height of the average screen, but if you click on one of them it will open the full size image, whatever size that may be. A letter "w" or "d" after the number of sheets indicates that the display is on "wide" or "double" size sheets respectively (although some displays on normal size sheets may include the occasional double width or larger sheet too). The examples here obviously represent only a selection of possible material; further scanned displays are actively solicited. Please see the 'how to provide a display' page for details, or contact the for further information. Copyright for these displays is retained by the original owners.